I forgot how much food can shock the senses until stepping into China Xiang in Hell’s Kitchen. It’s been on my radar for some time basically because of the crowd it draws. The restaurant serves authentic Hunan cuisine that turns up the heat. The first dish we tried was sliced pork belly with spicy garlic sauce. What arrived was a mound covered entirely with red chili sauce. Peel away the top layer and it reveals thin slices of pork. Did deeper and there is cucumber which helps to tone down the heat. The Hunan noodles are another popular dish made with rice or egg noodles. You can get it with braised beef flank, pork ribs or stir fried farm house pork in a spicy broth. 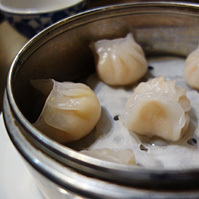 If you're trying to avod the heat, you may want to opt for the dim sum, including plump crystal shrimp dumplings or tea smoked duck. Other dishes like steamed whole fish with chopped chili can really ratchet up the heat.